LUTON, England, 2018-Aug-29 — /Travel PR News/ — easyJet has today (28 / 08 / 2018) launched a national campaign to inspire more girls to become airline pilots. In a recruitment film released today, the airline reimagined a famous scene from Hollywood movie Catch Me If You Can where Leonardo DiCaprio impersonated a high-flying pilot in an airport. By re-shooting the movie scene easyJet hopes to correct misconceptions forwarded by Hollywood movies like Top Gun, The Aviator and Flyboys that being a pilot is a man’s job. easyJet surprised holiday-goers and business travellers at London Southend Airport by reshooting the famous scene with a cast of children, aged between five and nine years-old, putting a girl front and centre. Leading the cast was nine-year-old Hannah Revie, the daughter of real easyJet captain Emily Revie. In the short film (dubbed ‘Catch Up, If You Can’), Hannah adopted DiCaprio’s swagger in full easyJet uniform and was flanked by an entourage of boys, playing the role of the cabin crew, aptly played by children of easyJet staff, to inspire young girls to pursue a pilot career. The stunt was initiated on the findings of easyJet research. 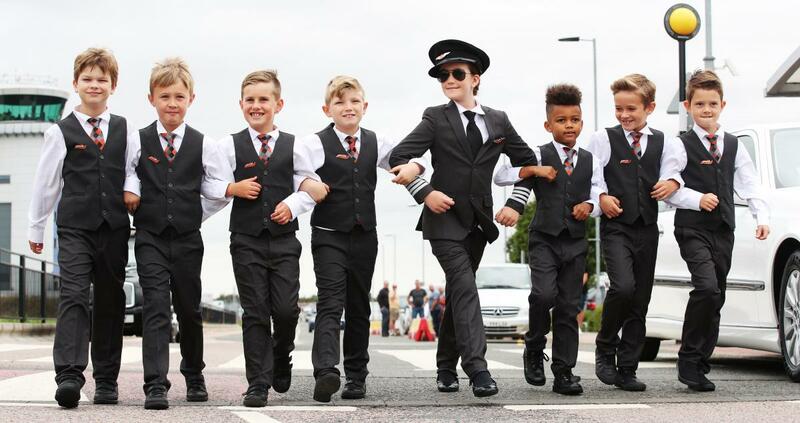 Its poll of 500 easyJet pilots found that as children, the boys were more likely than girls to consider a career as a pilot. More than half (55%) of male pilots knew they wanted the job by the age of 10. Women were less keen, as only half (50%) had only thought about the career by the time they were 16 – or even older. Startlingly, over one fifth (22%) of male pilots were already sold on the job by the age of five. easyJet is championing female pilots of the future in anticipation of the first day back to school for UK students next week, as many children return to a new term considering their future career options. The airline wants to encourage new talent into the cockpit to address an industry gender imbalance through its Amy Johnson Initiative, which it launched in 2015. The Initiative has been linked with an influx of female talent to the airline – new entrant female pilot numbers at easyJet have grown from 6% (2015) to 13% (2017). easyJet has set a target for 20% of new pilots joining the airline to be women by 2020 at a time when only 5% of all pilots worldwide are female, as benchmarked by the International Society of Women Airline Pilots. easyJet’s research found that positive childhood role models, like TV and movie stars, family members, and meetings with real pilots, were vital to inspiring young people to consider the career and so the airline is continuing its campaign to increase the visibility of pilots outside of airports. In the three years since launching the Amy Johnson Flying initiative easyJet pilots have visited more than 150 schools and colleges to promote the career. The airline is now also working with Girlguiding to offer an Aviation badge for Brownies. In FY 2018 easyJet will recruit 460 new pilots to meet record demands for the airline for a third consecutive year, as its European network continues to grow. Opportunities range from cadet pilots starting their career to experienced co-pilots and captains from other airlines and the military. The Generation easyJet Pilot Training Programme is open from the 3rd September for aspiring pilots to apply. This entry was posted in Airlines, Travel, Travel & Kids, Travel Education & Courses, Travelers and tagged airline pilots, campaign, Chris Browne, easyJet, Emily Revie, girls, Hannah Revie. Bookmark the permalink.